A fine blend of historical places, beaches, temples, wildlife and rich heritage is what makes most of the beautiful western state of India, Gujarat. It is home to relics of times as old as the Indus Valley Civilisation. The rich culture of Gujarat is celebrated with such grandeur, which can be witnessed during festivals like Navratri. With their distinct folk dance like Dandiya Raas, distinct cuisine and rich heritage, Gujarat is definitely worth a visit for a holiday. Witness the state's architectural marvels and have the best time by doing the following things to truly experience the essence of Gujarat. The only place you can ever witness Asiatic lions is the Gir National Park in Gujarat. Home to these endangered species of lions, Gir has seen a steady increase of their population over the years. The national park has a very rich and diverse biodiversity that is essential for these animals to thrive. Some other animals you can explore during a safari in this sanctuary include striped hyenas, Indian leopards, blackbucks, ruddy mongeese, to name a few. Recently declared as a UNESCO World Heritage City, Ahmedabad is a significant city where every street has a story to tell. Walk through the streets of Ahmedabad and witness the rustic, old-world charm that gleams through the buildings of small neighbourhoods, heritage sites and more. Ahmedabad tourism has properly guided heritage walks through the city, which is even available as audio guidance. Diu has a heritage of the Portuguese who used to rule this region in the past. The port city of Diu has a number of beaches lined up at its coast. Indulge in beach-hopping to the serene beaches of Diu, such as Ghogla Beach, Nagoa Beach, Goptimata Beach, etc. Also explore the Naida Caves or revel in the historically significant Diu Fort, where you can see the brilliant architecture of the Portuguese. Since the infamous Dandi March was initiated from here by Mahatma Gandhi, Sabarmati Ashram is one of the most important tourist attractions that was declared a national monument. The ashram has a museum where you will see galleries, exhibitions, archives and other such relics of Mahatma Gandhi. You can go for the 90-minute guided walking tour through the ashram that takes you through places like Magan Niwas, Upasana Mandir, etc. To view an extravagant palace that eludes royalty, visit the Laxmi Vilas Palace in Vadodara. This stunning palace is an enormous structure that is said to be four times the size of the famous Buckingham Palace. It is built in an Indo-Saracenic architecture by Maharaja Sayajirao Gaekwad III way back in the 1890. A part of the palace is open for visitors which consists of the Maharaja Fateh Singh Museum. Here you can see collections of splendid sculptures made of marble, bronze, etc. Located at Champaner is the Champaner-Pavagadh Archaeological Park, which is a park spread across an enormous area of 3,280 acres. It is a city that was built by King Mahmud Begada, which contains magnificent mosques, temples, forts, fortresses, etc., spread all across the region. Some of the beautiful structures that you can visit here include Nagina Masjid, Kevada Masjid, Kalika Mata Temple, Helical Stepwell, to name a few. 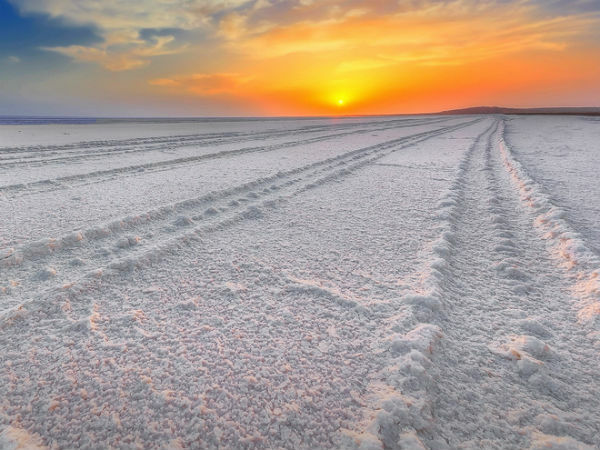 A visit to Gujarat is quite incomplete without heading to the Rann of Kutch, one of the largest salt deserts in the world. It is a huge space that looks milky white and is sprawling across 7,505 sq km. Ideal time to visit Kutch would be during the Rann Utsav, a festival that takes place annually that usually falls in November. Witness and experience the culture and traditions of the state that are portrayed during this boisterous festival.